The Sonoran Sky resort is one of the newest luxury resorts on Sandy Beach in Rocky Point. The Sonoran Sky has a full service spa, aqua bar, state of the art fitness center, water slide, beach front swimming pools, Jacuzzi and a convenience store. 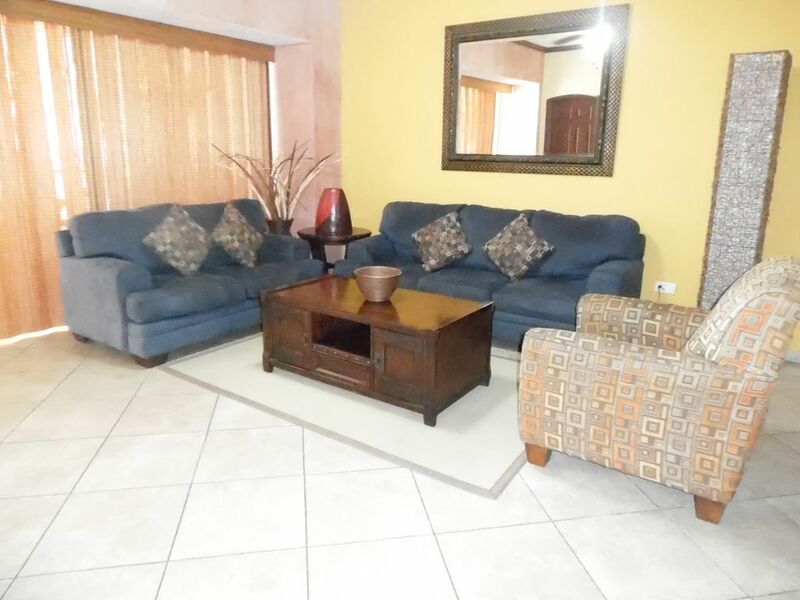 This condo is located on the 4th floor and it can accommodate up to 6 guests; two in each bedroom and two on the queen size pull out bed in the living room. The entry of this beautiful condo has a recessed soffit with a hanging art deco chandelier. The hallway will lead you to the living room that has been furnished with a dark blue cloth sofa and two lighter beige arm chairs. The walls of the room are a bright sunny yellow. There is a mirror above the sofa and a wall mounted flat screen TV on the opposite wall. Below the TV there is an entertainment cabinet that houses the DVD, VCR and stereo system. You have access to the terrace through the living room sliding glass doors. The dining room of the condo has a wood table set to seat 6. The kitchen is outfitted in granite counter tops, dark alder wood cabinets and stainless steel appliances. Wolfgang Puck would be happy in this state of the art gourmet kitchen. You bring the food and we have the tools to make it a meal. The kitchen has a built in wet bar with matching stools, sink and a wine chiller below. The master bedroom has a bright yellow wall behind the king size bed and the wall with the doors to the terrace are Venetian plastered in tan. The bedroom has a matching suite of furniture with a very neutral colored bed spread. There is a wall mounted TV and DVD player opposite the bed and a mirrored closet on the other wall. The master bathroom is complete with its own Jacuzzi tub, separate shower and a double sink vanity. The second bedroom is also furnished with a king size bed with a matching suite of furniture, huge mirrored closet and a TV / DVD combo. The terrace has been furnished so that you never miss an amazing sunset over the Sea of Cortez. Rocky Point has some of the most beautiful sunsets in the entire world. You will not want to miss them. The terrace has a dining table set to seat four people, a wet bar, and two chaise lounge chairs. The wall of the terrace above the wet bar has been decorated with a metal gecko lizard. The condo comes with a washer, dryer and ceiling fans throughout! Welcome to paradise! We can't wait for you to see what everyone is talking about! The location is good but the overall condition of the condo needs major TLC from the owners. The new sports bar in the complex could never decide if they would be open or not but they did have great food. They need to take the phones away from the employees. They apparently think looking at the phone is much more important than customer service. If there was a little more concern and action from the condo owners and complex management I would go from a 2 star to a 4 star rating. Nice pools and nice beach.